Financial problems, considering bankruptcy, feeling hopeless? Listen to Pete Seeger. 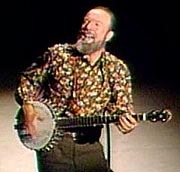 Pete Seeger, America's legandary folk singer and activist, died recently at age 94, leaving a legacy of song and hope. Arlo Guthrie, son of Woody Guthrie and a great folk singer in his own right, said of Pete Seeger, "He would just wave his hand, and you could hear people singing." I invite you to take five minutes to watch and listen to his 1970 performance (with Johnny Cash) of the Worried Man Blues. "This song is the whole human race. Crossed that river and I fell fast asleep, woke up with shackles on my feet. Crossed the ocean, we thought we solved all our problems. You have that revolution, you get that home, you get that job, you think you solved all your problems. You cross that river and found you have shackles on your feet. And who's the judge, just some old guy 74 years old in black robes? Might be the young judging the old, or the poor judging the rich. A little bitty hand was waving back at me. It takes a worried man to sing a worried song, I'm worried now, but I won't be worried long." If you don't see the video below, click on this link to see it on youtube. ← Wait until you're sued to file bankruptcy, or file earlier?